I never believed in love at first sight. All the things a girl is supposed to fall in love with, like pretty shoes or fancy purses, never caught my eye. I even let my dad pick out my wedding dress. That all changed when I met my house. I fell in love as soon as I walked in the front door. It didn’t bother me when the home inspection told me it needed a new roof, drainage work, a new water heater, and oh yeah, bathroom work. Specifically, both bathrooms would need to be redone ‘in the next year, maybe two, sooner rather than later, but it’s no rush.’ I figured that all I had to do was find a good contractor and write a check. The home inspector thought the job would take four to six weeks. 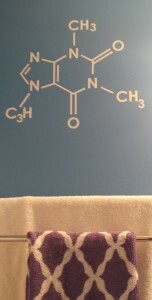 My favorite drug – Blessed caffeine adorns the walls of my guest bathroom. Half way through the process it turned out we didn’t have enough space. Thus, we stole several square feet from the dining room, bedroom, and the hall bath to make the master bathroom fit. As a result my hall bath designs went from ‘super cool chemistry lab’ with beakers for hand soap and an Erlenmeyer flask for mouth wash, to ‘very simple’. At one point we had shower curtain bedecked with the chemical equations for our favorite things – sugar, cream, vanilla, chocolate, and honey. 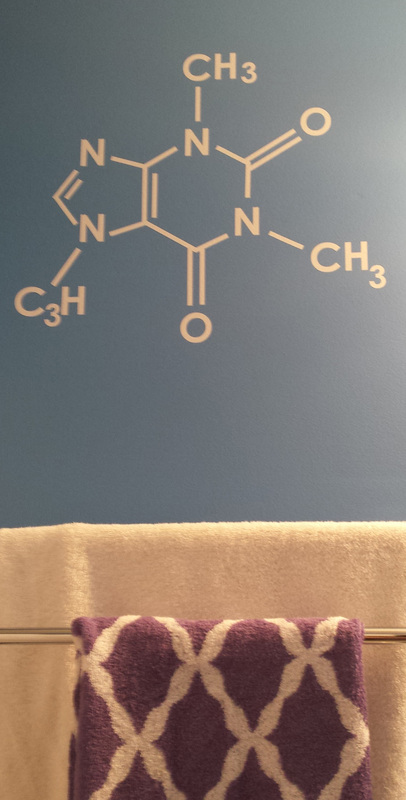 Unfortunately, the molecules dissolved after the first shower. Thankfully the caffeine survived. 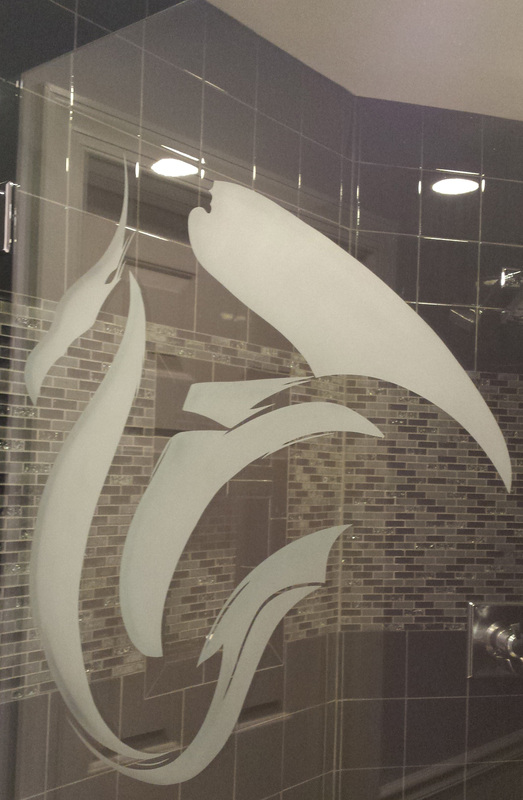 Glass etching is surprisingly affordable and I really, really like the dragon. He provided a great way to personalize the bathroom without adding clutter. 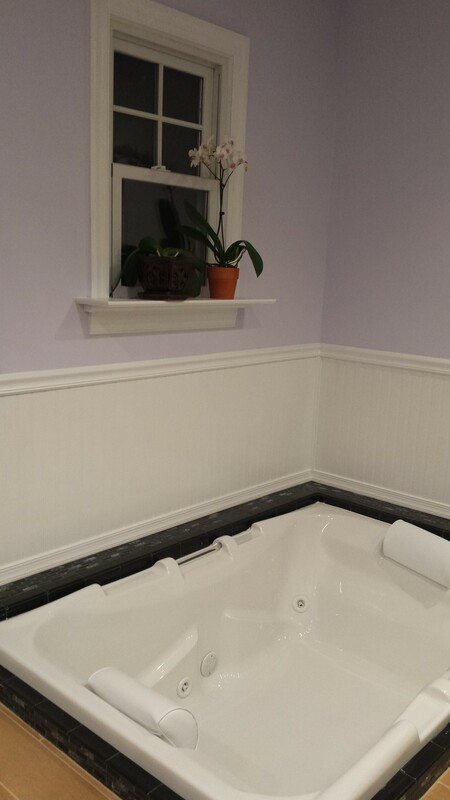 Sinking the tub into the ground was my contractor’s idea. It’s a great way to hide water damaged wood or anything else that’s caused giant holes in your floor. 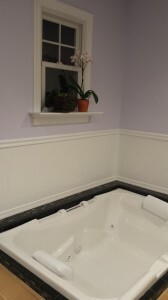 Luckily we had enough of a crawl space that we could create a concrete ‘box’ around the tub to keep the water warm. 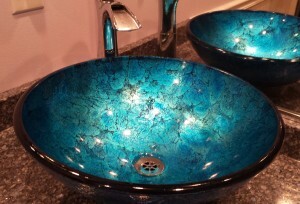 Another favorite is the art glass vessel sink. It’s not very practical but the pretty blue color wakes me up in the morning with a smile. Tile may not match the sample tile. It may not be available at all (even after you have been charged for the order). Slight differences in the tile name like ‘black glossy tile’ and ‘glossy tile – black’ are significant. Work with a tile company that allows returns. All details should be in the contract or on paper. If a change is made it needs to be documented. Some things can be changed later, some can’t. If it isn’t in writing, it won’t be changed. Dust gets everywhere. Incremental cleaning helps to some extent. Plastic barriers over the entryways to the construction area help more. It’s perfectly normal to vent natural gas into a house when working on gas pipes. Keep a jug of water in the fridge to drink on the days when the water is shut off. Keep another jug under the sink for washing on those same days. Grout must be sealed. It has to cure first. Don’t try to shower the first night the shower looks ‘done’. I’m not complaining. I know I’m blessed to have a beautiful functional bathroom. Still, if you ever decide to undertake a bathroom remodel, drop me a note. My horror stories might help. Until then, be careful with love at first sight.